There’s no denying our city has an abundance of delish places to eat. From charming cafes to bustling takeaway joints, there’s no shortage of options. However, sometimes you just want to get out of the hustle and bustle of city life. There’s something special about dedicating a day (or even just half a day) to spending time with your nearest and dearest, embarking on an adventure and devouring some mouth-watering food while you’re at it! 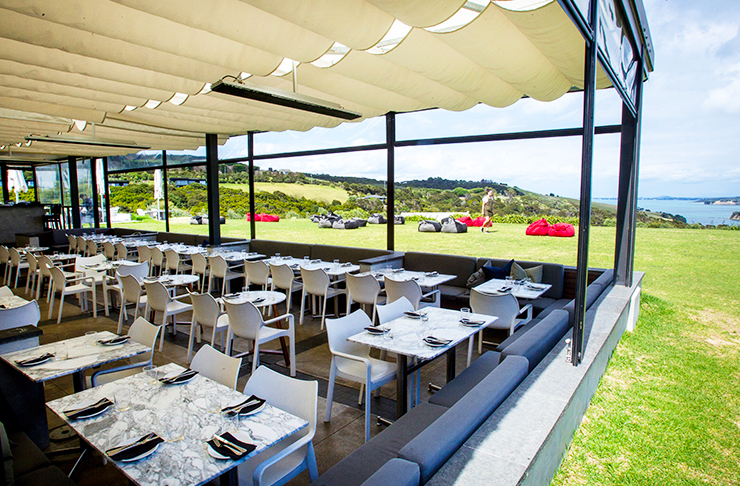 Located on the much-loved Waiheke Island, Cable Bay Vineyard is one heck of a destination restaurant. The food and wine are divine and the views will leave you breathless—seriously, this place is stunning. Sound like a bit of you? Allow us to explain why this is the most incred destination restaurant—ever. Every good adventurer knows half the joy is in the journey. The most common way to get to Cable Bay is via passenger ferry (alternatives include car ferry, private boat or helicopter—just casually). Head to the downtown terminal where you’ll embark on a pleasant 40-minute cruise across the Hauraki Harbour. Cable Bay is the closet vineyard to the Matiatia Wharf—how very, very convenient. Take in the beauty of the island with a scenic 15-minute walk through a forest and bird reserve and—volià!—you've arrived. Upon arrival, the first thing you’ll notice are the incredible views. Cable Bay boasts a sweeping lawn surrounded by picturesque grape vines. From here, you can take in views of the glistening Hauraki Gulf with Auckland City’s iconic skyline on the horizon. The restaurant is positioned to showcase the views with floor-to-ceiling windows in The Dining Room and sliding screens in The Verandah’s outdoor terrace. On warmer days, there are beanbags and rugs on hand so you can laze on the lawn while soaking in the sweet, sweet views—dreamy, much? Following a garden-to-table philosophy, Cable Bay is all about using seasonal produce sourced from the vineyard’s organic garden and orchard. Food waste from the kitchen is used as compost, producing a garden flourishing with veges, herbs, baby leaves and edible flowers. The chefs hand-pick the produce daily to create mouth-watering dishes to serve to hungry patrons (i.e. you!). What’s more, Cable Bay raise their own chickens for eggs and have their own honey hive. Talk about fresh, quality produce! There are two equally impressive dining options at Cable Bay: The Dining Room or The Verandah. The elegant Dining Room restaurant is housed in a large, open space with a warm and inviting interior. There are wooden tables, modern pendant lighting and pieces of contemporary art. During the cooler months, a crackling fireplace creates a cosy sanctuary. 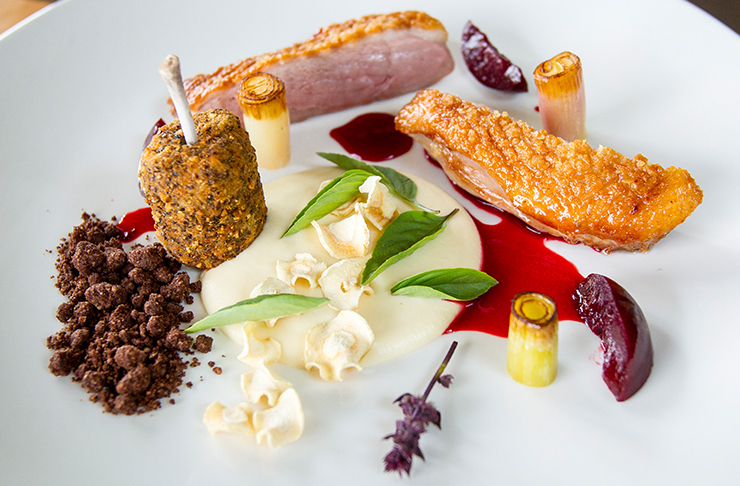 The dishes served here are best described as works of art, showcasing a thoughtful combination of flavours, colours and textures. Better yet, the ever-changing menu is shaped with Cable Bay’s wine offerings in mind to create the perfect pairing. Alternatively, The Verandah is an outdoor terrace perfect for passing the day away. The space showcases marble tables, cushioned booths and plenty of indoor-outdoor flow. The Verandah’s menu has Mediterranean influences and encourages people to embrace a long, leisurely dining experience. The food is designed to be shared with wood-fired pizza, lamb cutlets and flavoursome salads all up for grabs. Their signature sharing platters are not to be missed with four options available: traditional mezze, cured meat—our fave—fine cheese! 6. There’s A Secret Romantic Dining Room! If you’re looking for a dining experience to impress, The Wine Library has your name written all over it. Tucked away in the underground cellar with views of the striking wine barrel hall, this room is Romantic with a capital R.
The space is dimly lit by a lavish chandelier, the sound system plays soft, romantic melodies and you’ll be looked after by your very own waiter. It’s the kind of place you take your special someone to ask them a special question (hint, hint). No visit is complete without savouring Cable Bay’s award-winning wine—our faves are their pinot gris and beautiful rosé. Enjoy a vino (or two) with your meal and check out the stunning cellar door that overlooks the winery below. Our advice? Opt for a wine tasting to find your own personal fave! See what the fuss is all about at the Waiheke Island’s stunning Cable Bay. For more details, including opening hours, click here. Editor's note: This article is proudly sponsored by Cable Bay and endorsed by The Urban List. Thank you for supporting the sponsors who make The Urban List possible. Click here for more information on our editorial policy.